Apple biscuits with cheese is a recipe you will love. 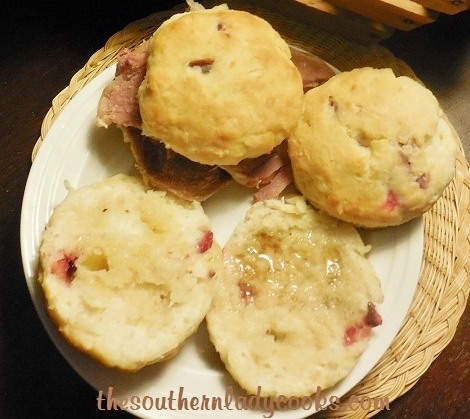 Anyone that follows The Southern Lady Cooks blog or Facebook page knows I love biscuits and am always looking for new recipes. Recently, I had some apples and decided to put them in biscuits. They turned out great. We enjoyed these with sorghum molasses and honey for a breakfast treat. I will try anything in a biscuit and this was well worth the effort. A great way to use apples, too. Apple biscuits are wonderful with your favorite jams and jellies. In a large bowl whisk together the flour, baking powder, baking soda, salt and sugar. Cut the butter into the flour until resembles crumbs. Add egg, buttermilk mixing with a spoon. Fold in grated apples and cheese. Pour dough out onto a floured surface. Pat to about 1/4 to 1/2 inches thick. (I just use my hands and pat the dough out.) Cut with biscuit cutter into rounds. Place on sprayed baking sheet and bake in preheated 400 degree oven about 15 minutes until brown on top. Makes about 12 to 15 biscuits depending on size of your cutter. (I used a juice glass for these because I wanted smaller biscuits). Serve with your favorite jams, jellies, molasses or honey. Enjoy! Don’t Forget to Pin Cheesy Apple Biscuits! I sure like the recipes. I don’t cook all of them. I wished I was able to. wonderful tasty yummy bisquits! just love the cheese with apples! Cheese and apples are heavenly! I made these this morning,they were awesome! Family loved them. A great twist on biscuits. Love this.